A brainchild of Satoshi Nakamoto, blockchain is an ingenious technology that Blockchain CIO should maintain a keen eye on as its evolution gains momentum. The technology has the potential to enhance efficiency as governments and private institutions continue to come up with applications leveraging its capabilities. Below is a brief blockchain executive guide on why and how the technology is set to impact people way of life in a big way. Blockchain deployments are scarce in part because very few CIOs have a clear idea of what the technology is all about. The fact that it is only now that people and organizations have started to explore the digital ledger technology potential, explains the limited as well as low adoption. A recent study by Gartner indicates that 66% of CIOs have shown interest in the emerging technology, it continues to send shockwaves all over the world. Huge chunks of money continue to stream towards the technology with China leading the onslaught. Venture Capitalists are also investing big in the emerging technology as they look to uncover its endless applications. 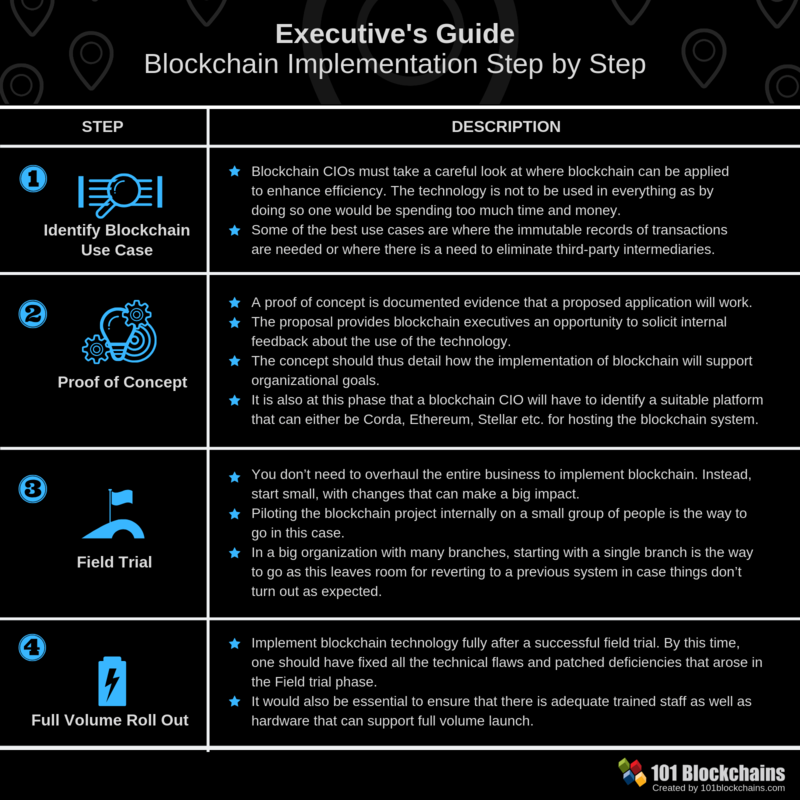 Below is a brief Blockchain executive summary that paints a clear picture of what Blockchain CIOs should take note off, in a bid to leverage the technology’s full capabilities. To many people, blockchain is simply the technology that underpins cryptocurrencies. While true, the technology has many use cases beyond cryptocurrencies that continue to elicit mixed reactions around the world. Simply put, blockchain is a type of digital ledger that uses complex encryption to ensure permanent and tamper-proof storage of records. 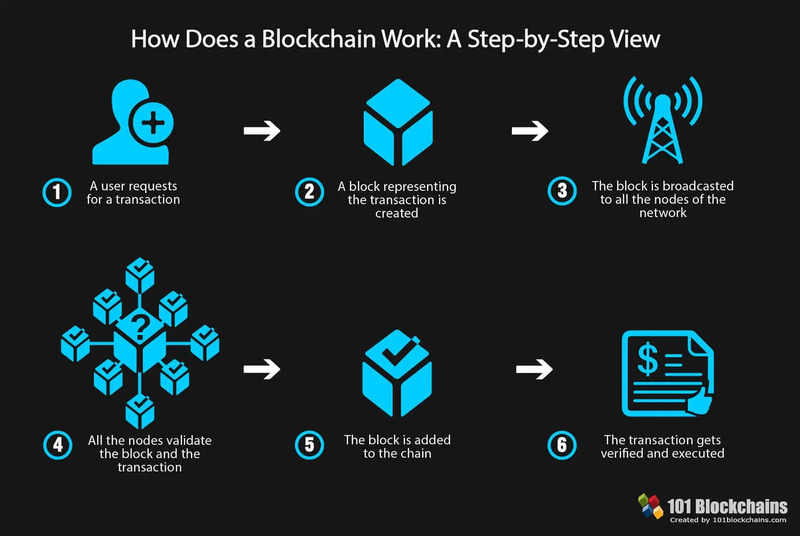 The simplest explanation of blockchain is that it is a distributed ledger, capable of storing records of all transactions in network. 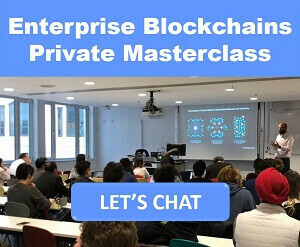 With the help of cryptography, every participant in a blockchain network can securely access the ledger without the need of a central authority. 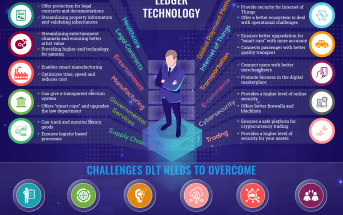 In an era where companies, as well as individuals, are facing challenges ranging from data management to security, blockchain technology implementation has emerged as an outright savior. Financial institutions have already taken note of the technology’s capabilities, given the rate at which most of them are exploring it as a means of securing and tracking the ownership of assets as well as for speeding up transactions. In addition to enabling fast and secure transactions, some companies are using the technology to track the movement of products and assets as part of supply chains management. Databases in operation now are managed and controlled by central authorities. Blockchain networks, on the other hand, cannot be managed by any central authority. Control is distributed in such a way that any computer connected to the network takes part in decision making. 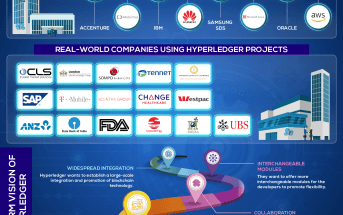 Digital ledger technology has already given rise to peer-to-peer networks used for various operations. 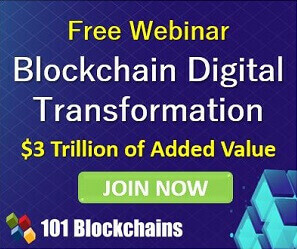 Blockchain executive implementation should thus be a no-brainer for organizations given that the technology will go a long way in replacing intermediary situations. For instance to send money one needs a bank or financial institutions to complete a transaction. However, with blockchain technology implementation that should be a thing of the past, as a way of hastening transactions. Learn more about Blockchain Technology. Four key attributes paint a clear picture as to why blockchain technology matters and why Blockchain CIOs need to be more receptive when it comes to its implementation. Consensus: For any form of consensus to be agreed upon in a blockchain network, all participants must first agree. What this means is that blockchain technology has the potential of preventing a select group of people from manipulating data to their advantage. Provenance: In an era where maintaining a paper trail that is tamper proof is essential all but calls for blockchain technology implementation. The digital ledger technology makes it possible for all network participants to know where an asset came from and how ownership has changed over time. Immutability: Tamper proof aspect has to be one of the biggest attributes that blockchain executives should take heed of when it comes to the digital ledger technology. Any information encrypted in a block cannot in any way be tampered with when recorded to a ledger. If the details in a block are incorrect, then a new transaction must be carried’ out to reverse the error without deleting contents of the previous block. Finality: Blockchain networks provide transparent platforms where people can go and determine the ownership of an asset as well completion of a given transaction. Taking into consideration the attributes mentioned above, it is clear blockchain technology provides the highest levels of transparency that blockchain CIOs can be proud of. Less oversight, cost savings as well as reduction of intermediaries are some of the other benefits that make blockchain desirable in the digital world. Blockchain CIOs need to understand what Blockchain is and how it works to be able to make good use of its capabilities. For starters, blockchain executives will have to agree to decentralization of their business models and processes. Projects powered by the ledger technology are poised to deliver business value worth pursuing at all cost. 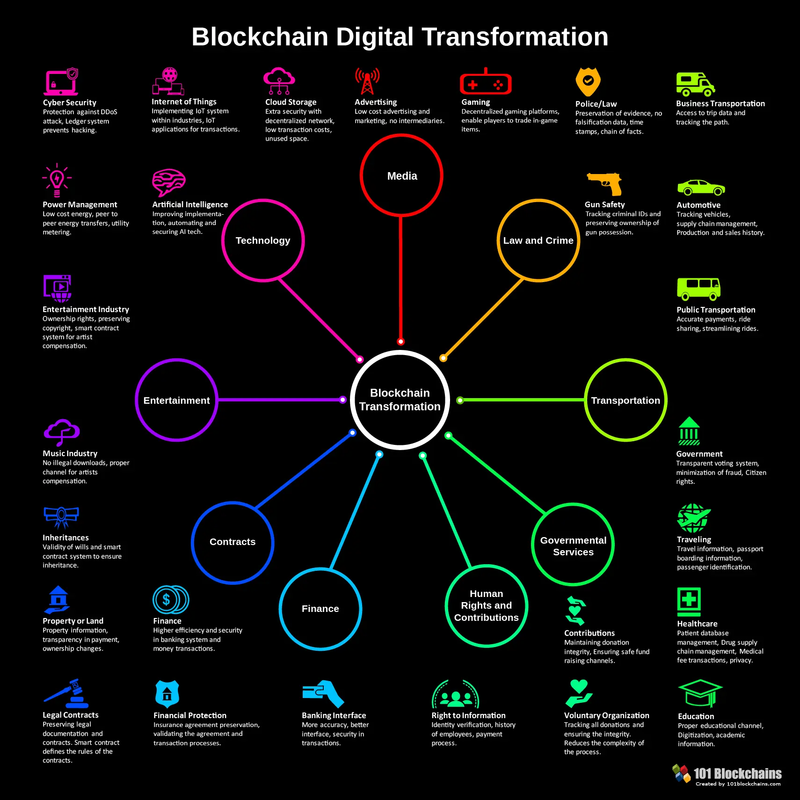 That said, blockchain CIOs need to be more aggressive in the implementation of the technology. Blockchain executives in various industries are slowly adopting the ledger technology in a bid to enhance efficiency and service delivery. The fact that the technology provides infrastructure for building next innovative applications beyond cryptocurrencies has seen it deployed in various industries from healthcare to finance automotive as well as tech space. Blockchain CIOs are slowly implementing the digital ledger technology in the healthcare sector as a way of enhancing service delivery. In healthcare, the technology is being used to secure healthcare records at a time when Cybersecurity is a significant threat. The technology is finding great use in securing clinical trials, patient medical records as well as billing records. Hosting such records on a blockchain ensures it is tamper proof to the extent that no one can tamper with. Blockchain executives are already exploring the possibility of creating a common database of health information that medical practitioners can access. Some organizations are using the technology to apply analytics on data from various distributed sources, while ensuring the highest degree of privacy. Life insurance companies are also leveraging the technology to detect fraud in the industry as well as facilitating dynamic insurer-client relations. Citi bank has already unveiled an insurance claims system that records each step of the claims process in a blockchain. Blockchain executives have also set sights on the real estate sector that for years has grappled with issues associated with middlemen like brokers, government as well as escrow companies. Blockchain systems listing all details pertaining to property have already cropped up all in the effort making it easy for people to see, explore properties and be able to make payments without involving middlemen. 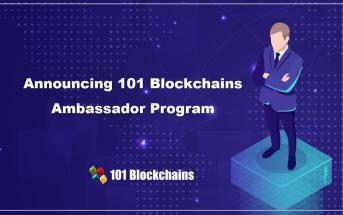 Blockchain implementation in the industry is also poised to cause a reduction in cases of fraud as escrows will now be made in a more secure and timely manner. By structuring transactions in the sector as smart contracts, transfers in future should occur as soon as all the terms of the contracts are attained. The technology will also ensure publicly available and verifiable record thus ensuring transparency of the entire process. If there is a sector that deals with a lot of records in the form of paper works then it has to be supply chain management. In the food industry for instance, there is always a long chain of distributor’s packages. Processers as well as grocers all of whom complicate the supply chain process. Given that each participates in the production process, all but calls for an effective reliable and tamper-proof chain for record keeping. Blockchain provides an easy way of ensuring all the records that come into being when shipping of products from the producer to the end consumer is stored securely and can be accessed at any given time. Blockchain use in the space should lead to new transactions between actors that are unfamiliar to each other but have something that they can transact. The technology should also lead to improved trust, workflow and transparency. Blockchain appears to have found great use in the finance sector given the applications already in place. Blockchain executives have used with great success the technology to speed up and simplify the process of making cross-border payments. The technology has also reduced the costs incurred in transferring huge chunks of money compared to other traditional forms of payments. Looking ahead, blockchain CIOs are exploring the possibility of leveraging the technology in share trading, in a bid to ensure greater trade accuracy as well as shorter settlement processes. Smart contracts powered by the digital; ledger technology are also slowly cropping up as they enable the automatic executions of commercial transactions and agreements. Blockchain technology is also being used to improve online identity management as people will soon be able to choose how they want to be identified’ online. There is no doubt that blockchain technology can transform how data is stored in the cloud. Given that current storage services are centralized’ such systems remain susceptible to hack attacks that leave people’s data exposed. Decentralization of the entire storage process would make it difficult for suspicious actors to gain access to any data stored in the cloud. Storj is one such company that is working on a cloud storage service that leverages blockchain technology to improve security and reduce dependency on centralized administrators. One of the biggest challenges that blockchain executives face on the implementation of the revolutionary technology is the lack of standards. Getting network participants to agree on a common network protocol where there are no set standards is slowly turning out to be the biggest threat to widespread adoption. While some companies may choose to deploy permission or semi-private blockchains, others are opting for permission less networks that anyone can access. Evolution of the technology has also seen an upsurge of regulatory hurdles as governments try to get a hold of a technology that is threatening to have a severe impact on various operations as well as sectors. Blockchain CIOs, especially in the financial sector, are also grappling with privacy and security issues associated with the technology. For instance, it is still unclear how much information about a trade, participants in a network ought to see. To run the algorithms computer power is needed which at times can cost a lot of power. For example, the amount of power required to maintain Bitcoin blockchain is more than the amount of energy consumed in some 159 countries. The massive amount of power continues to strain the main power infrastructure leading to unexpected costs. The digital ledger technology has proved to be complex to blockchain executives, which explains its limited adoption. It takes a while for Blockchain CIOs to understand the principles of encryption as well as the distributed ledger aspect behind the technology. The complexity aspect has also made it difficult for blockchain CIO to appreciate its benefits. For instance, in the banking sector, some banks are reluctant to embrace the technology given that they can provide services at low costs without having to adopt the technology. Due to the complexity as well as distributed nature, blockchain transactions at times tend to take a while to process compared to traditional payment systems. For instance, bitcoin has grappled with scalability issues for years something that has prevented it from processing many transactions as the likes of PayPal does. Some blockchains are designed to be publicly visible for everyone to see. Given that all information pertaining to a transaction is available for everyone to see, as is the case with Bitcoin blockchain, has not gone well with most blockchain executives. With the exception of privacy-centric coins, this is always the case with most blockchains, something, which continues to arouse privacy concerns. While the transparency aspect of blockchain is good, at times it becomes a significant headwind, especially when dealing with sensitive information such as patients records. Blockchain CIO may thus have to alter ledgers to limit access to data as a way of ensuring privacy. Blockchain networks remain susceptible to 51% attacks that occur when a certain group of miners or nodes gain full control of a chain such that they are the only ones who are to dictate what gets processed. While the minors won’t be able to alter previous blocks the fact that they control future transactions all but derails what blockchain stands for. Blockchain technology has the potential to enhance various operations regardless of the industry of application. Even though the technology is still in the nascent stages of development, Blockchain CIOs can still explore it as it holds enormous promise. 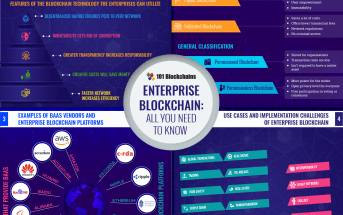 However, to ensure successful blockchain implementation blockchain executives will have to ensure that an organization does indeed need the technology in the first place.